Northern Indiana Tourism Development Commission (NITDC) is a regional partnership of tourism and economic development organizations in northern Indiana. NITDC works in cooperation with the Indiana Toll Road division of the Indiana Department of Transportation, with the Indiana Tourism Division and with local businesses to increase tourism spending in our region. 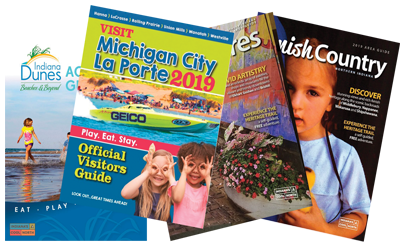 Using consumer research and professional marketing expertise, NITDC develops an integrated cooperative marketing and advertising program annually allowing for partnerships with the region’s tourism businesses and attractions. Being the Northern Indiana brand custodian, convener and counselor by engaging citizens, cultivating and communicating experiences, attracting talent and investments and developing sustainable organizations. Northern Indiana can best compete for increased visitation by positioning itself as a single destination. This can only be achieved by combining the resources of the region’s destination marketing organizations, the private sector and the Indiana Tourism Division (ITD) to create integrated marketing programs that allow for the building of a strong regional brand without undermining the brand equity of each member. We commit to create incremental business opportunities through an integrated and value-added approach of place making and communications strategies that mutually meet the common goals of partners.